There are a lot of hydraulic cylinder manufacturers and pneumatic cylinder manufacturers to choose from. But when your job requires precision, high-quality cylinders that can withstand the most grueling applications, our products stand the test of time. For more than 50 years, we’ve grown B&H Machine, Inc. to better serve our customers’ needs. We offer a standard catalog of hydraulic and pneumatic cylinders and stand behind the quality of each one. We can help you select the right cylinders for your job, deliver them on schedule and ensure our they produce the results you need. Our complete series of products includes over 10,000 models. When a custom design is the best solution, our professional engineers design heavy-duty hydraulic and pneumatic cylinders to your exact specifications. We take the time to understand your application needs and then work with you to ensure precision-engineered design and quality performance. Our engineering expertise makes us one of the leading hydraulic cylinder manufacturers in the USA. Each of our heavy-duty hydraulic and pneumatic cylinders are built with precision in our 70,000-square-foot production facility. Our machining capabilities include the latest technology advancements, which allow us to efficiently and accurately produce cylinders to your exact specifications. 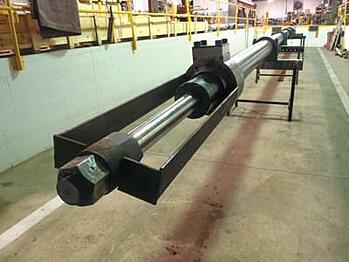 We specialize in manufacturing large bore and long stroke cylinders. Our manufacturing facility can also be used for other custom machining work. We utilize the same proven processes to build parts when our customers need specialized production. We work with customers to understand their needs and recommend cylinder solutions that make the most business sense. We analyze existing needs, forecast future demand and take a hard look at the return on investment of new versus rebuild or repair. When that solution is to rebuild or repair an existing cylinder, our experience, equipment and experts enable us to repair and rebuild hydraulic cylinders from any manufacturer. Rely on our quality, dependability and accuracy to produce the cylinders you need.